Summer is in full swing and we’ve had a cracking start to the new year. Among all the Christmas festivities, we launched a beach going activation for one of our favourite clients - Billabong. In with the likes of the personalised Nutella jars to the personalised Coke bottles, we thought we’d kick off the year with a deep dive into just how Insta-products and banners and personal engagement with Billabong’s audience transformed a sunny day into a shareable, immersive experience for Billabong and their loyal tribe of fans. Billabong approached us wanting to give their audience a whole new experience - one that was personal, interactive, and left each and every person with a unique reusable product customised just for them. Oh, and did we mention each product was delivered instantly? 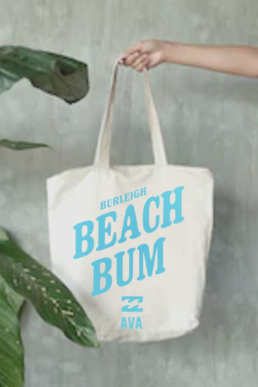 By creating branded, reusable tote bags and coffee cups, we were able to create an immersive connection within an environment that encapsulates the Billabong brand experience - beach side on a sunny summer’s day. Each product was printed with the name and design of choice for each participant, and delivered instantly thanks to our rapid printing technology. After all, who wants to wait around for a freebie? But we like to take the concept of ‘instantly shareable’ to the next level. An image of each product was instantly attached to emails, mms and social media posts, further spreading the brand love, whilst collecting data at the same time! The combination of our Insta range with our sharable content means that the impact of this activation was spread far and wide beyond the Billabong tent. Advertising to your target audience is one thing, but giving them an immersive experience with a personal touch gives them the motivation to connect with your brand on a deeper level - and gives them a positive, memorable experience that lasts long after the event. With the integration of instantly shareable social media content, partnered with personalised goodies for fans to take home, Blink Republic can turn any environment - from retail spaces through to sport and music events - into an engaging experience that allows customers to share brand love with fun and unique content. With a variety of Insta options available - from branded products to banners - Blink Republic can help you turn your next activation into a holistic brand experience that fuses online marketing with real life, tangible interaction with your audience. Not a bad day at the beach if we do say so ourselves! If you’d like to find out more, drop into our Inbox here , we’d love to chat. An experiential campaign is without a doubt the best way to garner interaction, engagement, and awareness with your audience. But what if you could amplify that impact in the lead up, throughout, and in the wake of your campaign? Well. Thanks to social media, you can. 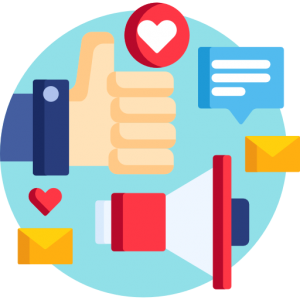 By using the community feeling, shareability, and reach that comes with avenues like Instagram and Facebook, you can collect vital data, amplify your message, and engage with your audience consistently throughout the lifetime of your campaign. Your social media tactics in the lead up to your experiential campaign are all about building buzz and anticipation. Start by promoting the unique features and useful information around the event (i.e. the when, where, and why), and start engaging with your audience through comments and likes in order to build brand loyalty on a more personal level. 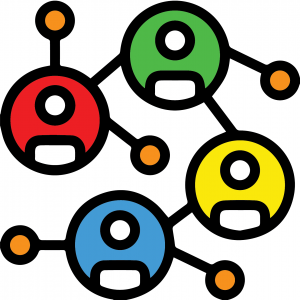 By doing this you can also gather data as to exactly who is engaging with your content, who is taking the initiative to sign up or find out more (through platform specific links, for example), and whether your choice of platform is reaching the ideal audience to garner the right interest in your upcoming campaign. To take the best advantage of amplifying your message via social media, it’s vital that you create a built-in social media sharing opportunity within your activation. This can be in the form of immediately sharable content like an image based activity, or in an “Insta-worthy” interaction that warrants a post (with your custom hashtag, of course) to your audiences social accounts. The custom hashtag also offers a way for you to compile your impact in a measurable way, interact with the accounts that have shared, and post content from your audience to your own business page. 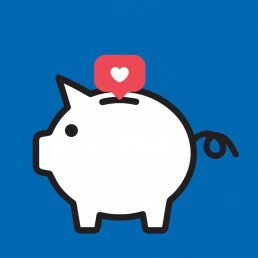 To further incentivise posting you can also offer event freebies like a giveaway upon proof of a share, or a discount code for your specific product or service. It all comes down to giving people a reason to share your activation with their peers, and taking advantage of the engagement opportunities when they do. Once your activation has come to an end, it’s worth investing some time into following up, liking, sharing, and commenting on all the content that was shared throughout the campaign. Re-posting your favourite content from your custom hashtag and sharing event highlights are the perfect way to keep engagement up and further amplify your impact. It’s also the perfect opportunity to promote any future events for the same campaign, or for future campaigns that will also have an experiential element to them. One of the most valuable aspects of utilising social media in your campaign is the data you get from it. You can clearly see the audience you reached - who they are, where they’re from - and compare it to your original target audience. Is it the same? Are there unexpected demographics in there? And if your results were not what you hoped for, is it perhaps worth investigating alternative social platforms that are more relevant to your target market? With incredible data and learning opportunities, and the opportunity to truly interact with your audience, social media is an absolute must to not only integrate but take full advantage of for your next activation! Need a side-kick to help you make this happen? Drop into our Inbox here , we’d love to chat. We’re proud to have helped hundreds of brands create unforgettable experiences for their customers over the past 12 months, but one campaign we’ve had the pleasure of working with truly knocked the ball out of the park when blending an opportune moment with the ultimate experience. With World Cup fever gripping the entire nation, Hyundai’s “Have a fling with football” campaign gave fans the perfect chance to cheer on the Socceroos through branded, instantly shareable content that was designed specifically with the World Cup in mind. Let’s dig a little deeper and see how Blink Republic was able to help Hyundai capture the essence of the country’s proud support of the Socceroos, and turn it into an interactive, shareable, and customized experience. With World Cup fever at an all-time high across the nation, proud sponsor of the Socceroos, Hyundai, came to Blink Republic in the hopes of bringing the electric and passionate atmosphere of FIFA 2018 to fans across Australia. By strategically setting up shop at some of the country’s prime World Cup viewing venues – including North Sydney’s Olympic Pool and the Woolshed in Melbourne - we created bespoke digital content (Blink Image) that gave fans a branded, World Cup themed image they could then instantly share via their social media channels with the customized hashtag #footballfling. With costumes on hand and epic backdrops to boot, it’s no wonder this campaign was such a hit with Socceroos fans across Australia! Hundreds of unique pieces of content were posted with our #footballfling fans. Hyundai not only ended up with an abundance of shared content to feature and share across their own social media channels, but the CRM data collected was used to raise awareness for future matches, as well as to help promote Hyundai as a proud sponsor of the Socceroos in the future. All in all, by taking advantage of the ‘football fever’ gripping the nation throughout Australia’s World Cup 2018 campaign, Hyundai was not only able to engage with fans and collect valuable data, but also offer supporters an exciting and fun-filled way to share bespoke content to help cheer their heroes on during their pursuit of World Cup glory. That’s what we like to call a win-win! With the winter sporting calendar quickly coming to a close for 2018, we thought we’d share some of the activation highlights we’ve achieved over the past few months with our major sporting partners throughout their seasons! We partnered with Chemist Warehouse to bring to life their “Tell Us Why You Love Netball” experience during six events in Melbourne and Tasmania. Sponsoring the Collingwood Magpies Netball Team, we used the interactive Blink Video format to film, edit, and broadcast fans’ responses with branded content. While there was a prize for best response, the real win was the engagement fans had with the Chemist Warehouse branded area. A little healthy competition went a long way for our Blink Active season campaign for the Adelaide Crows. Giving a glimpse into a life-like draft competition, fans were timed through a football camp themed course where they gave their best at training exercises, ball practice, and a footy tackle. With a leaderboard driving the competition, fans were rewarded with an image captured of their final tackle along with their time score for the course. Not only did the Crows get real life engagement with their fans pre-game, but also real-time content amplification through the sharing of their branded images that captured the spirit of the game perfectly. Geelong Cats had a goal this season – and that was, to engage with their fans on a whole new, interactive, and ultimately fun level. Through Blink Game Face, we created bespoke club merchandise for their Stand Proud campaign that fans could add to the images they took supporting their favourite team. The content was instantly shareable via social media channels, email and MMS, putting a face to the countless, tireless fans “Standing Proud” for their team! Everyone loves the chance to show their support for their team during a big game, so we teamed up with the New Zealand Chiefs and First Windows to create bespoke Blink Insta banners for fans to show off during the match. Instantly printed and shared with eager fans, the banners were not only a popular favourite on social media, but garnered extensive media coverage throughout the televised events. Activations like these are just some of the ways Blink Republic can help bring awareness to partnerships and elevate fan engagement for sport clubs and brands alike. If you’d like to chat about how we can take your event to the next level, get in touch today! 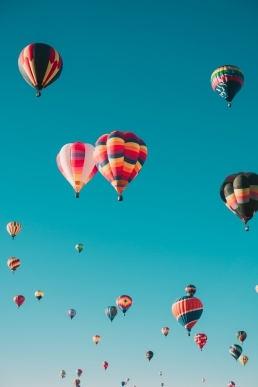 When people think of experiential marketing, they think of the main event. You know, where your brand is connecting with your audience and your engagement levels are off the charts. The experience though? Starts long before, and continues long after your event. For increased engagement, organic growth, simply encouraging your audience to post an image with your brand in the background may not be enough. To go that extra level for social media, add a viral element to your campaign, and leverage the power of it in a smarter interactive way. Create a unique #hashtag (one that your brand can really own) that is specific to your event so that you can track all of the tagged posts on social media. Filters - did you know that Blink Republic can create custom photo filters that people can use to create on-brand content, not to mention the extra sharing power that comes with it? Facebook and Insta stories - People invited to an event online can upload videos to that events “story”. It’s another great way to get new content, tags, shares and likes rolling from audience sourced content. After all, it’s not really an event if no-one shows up, is it? Pre-event awareness is just as important as the event itself. It’s how you build suspense, excitement, and garner support among your target audience. Sending out an invitation isn’t quite enough - you really have to answer the main question from your audience...what’s in it for them? Every experience should have an interactive element - whether that’s giveaways, fun content creation, physical activities or anything else that will build a connection with your audience. Whatever that element is, make it known. Use it to gain people’s attention, to build their interest, and show them it’s something they don’t want to miss. Handing out free coffee? Catch your audience at the peak ‘craving’ time - aka Monday morning! - and entice them the idea of free caffeine. Setting up a cricket batting cage? Encourage dads to bring their sons down for an afternoon of sport and laughter. It’s all about targeting the pain (or pleasure) point that your product is there to trigger, and offering a worthwhile solution to your audience. As the saying goes “it’s not over til it’s over”. Just because the last person has left, and the last product has flown off the shelf, it doesn’t mean the impact and awareness that your campaign has produced stops with it. 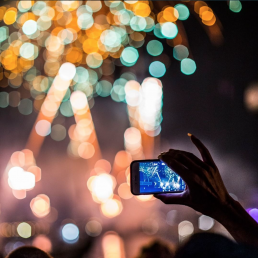 Repurpose any content created - by you or your audience - to showcase just how interactive and entertaining the experience was. Create a case study with any positive feedback or reviews you received during the event - social proof is a huge instigator for new clients. Get people excited for the next one - showcase the stats and content you gathered from your experience to drive more interaction, whether for your next event, your next online sale, or your next in-store experience. It’s important to keep the momentum alive! As you can see, there’s much more to experiential marketing than the experience itself. 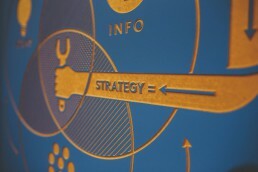 It’s important to establish your goals, know your audience, and craft an experience - from beginning to end - that not only builds brand loyalty and a stronger consumer connection, but that works as a part of your marketing strategy as a whole to guide your business towards your bigger picture. In late 2016, one of the most anticipated members of the PS4 family, PlayStation VR was launched around the country and Blink Republic`s Social Video Platform was used as part of an interactive roadshow. Agency partners The Zoo Republic and Rockstar Management developed the consumer experience and experiential activation space incorporating a huge 10m x 10m interactive booth to give consumers the opportunity to try PlayStation VR for the first time before its release to the market. The campaign commenced in Melbourne, visiting key states with ten major activations. 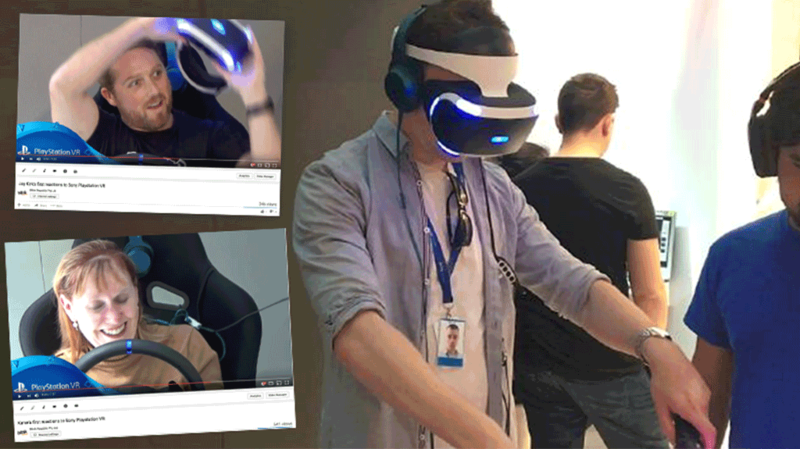 As participants put the PlayStation VR headsets through its paces Blink Republic’s Social Video Platform captured video footage and images that could be instantly shared across social networks. For most participants, this was not only their first time trying the PlayStation VR Headsets but their first time trying virtual reality, with their reactions making for brilliant social content. "Working with Jamie and the Blink Republic team was so refreshing, very rare to see a team so dedicated bringing ideas to life even if it meant trying completely new workflows or technology, utterly amazed to have such a great Partner." Each personalised video was edited and sent to participants as they left the activation, ensuring maximum exposure and Social sharing for PlayStation. 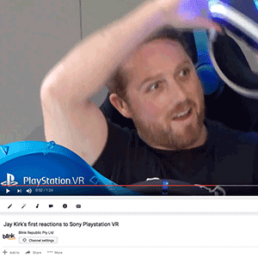 The videos featured customised PlayStation VR branding and were sent to each participant as a HTML email with links to share and to more content. The videos were accessible via YouTube with many of the videos going viral generating more than 25,000 views. To increase social sharing and amplification of the PlayStation VR events, participants also had photos taken which were instantly branded and sent directly to them giving them a memento from the PlayStation VR launch and content to be shared on Social Media. We'd love to talk to you about using our Social Video Platforms to increase Engagement, Social Media Amplification and Data Capture. As part of fan activations for the Hawk’s Round 15 clash against Collingwood at the MCG, long standing sponsor BUPA have rolled out a unique, interactive fan experience as part of their ‘Team Family Zone’. 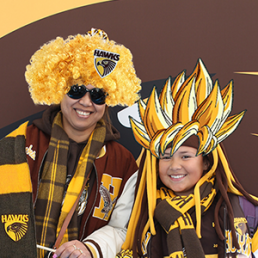 GameFace technology enables Fans to create customised images featuring bespoke Hawthorn themed stickers and filters which are instantly applied to fan photos. The technology plays on the Social Media trend for creating customised photos which has helped drive the popularity of Snapchat and Instagram. Using GameFace, bespoke stickers and filters are created including filters, props, wigs, mascots and club logos. As part of the interactive experience Fans have their photos taken in a customised branded booth. Fans instantly shared their photos from touch screens at the event and took away a printed version creating a great buzz around the ground and on Social Media. The BUPA TEAM FAMILY ZONE activation was the first time GameFace technology has been used at an AFL activation. The platform has previously been used to increase fan engagement and social sharing at the State of Origin Maroon Festival and by the Sydney Sixers as part of the Big Bash League. We'd love to talk about using GameFace to increase Engagement, Social Media Amplification and Data Capture. If your goals are to; increase brand awareness, convert customers to your website, be on the first page of a search engine, build relationships and retention with consumers... engagement is an incredibly important KPI. ... And where to find the best avocado on toast in Sydney. This is achieved when the overall UX is considered. Producing varying forms of content specific to the desired audience and offering IRL tangible experiences fosters a loyal community and maintains brand relevance. To maintain relevance content needs to be meaningful, in line with the brand ethos and make the viewer feel as though they are a part of a like-minded community. In digital marketing the action of selling a product or service comes second to building audience relationships. Once a relationship is established it's much easier to incentivise the individual to take the action your brand desires. 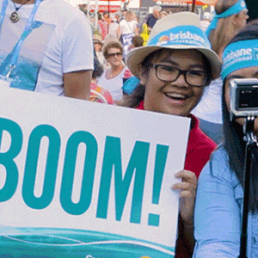 Record numbers of fans made their way to tennis arenas this summer, but before this they headed to the fan zones. Whilst here fans had time to dwell, catch all of the action and support their favourite players with brand activations like Suncorp's INSTA-banner.